English musician and composer Greg Haines made his Royal Ballet debut in 2013, writing the original score for David Dawson’s The Human Seasons. Haines developed an interest in sound and the devices used to create it at a young age, playing the piano and cello and experimenting with recording. The opening track Snow Airport of his critically acclaimed first album Slumber Tides (2006) was featured on the Point Music/Universal compilation Reflections on Classical Music, alongside compositions from some of the composers who inspired it, including Gavin Bryars and Philip Glass. Haines’s other recordings include Until the Point of Hushed Support (2010) and the albums Digressions (2012) and Where We Were (2013). As a performer Haines has toured throughout Europe, Japan, Australia and the USA. He is a member of several groups, including The Alvaret Ensemble and The Group. 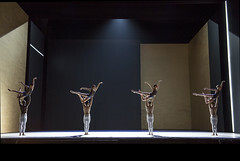 Haines has worked regularly as a composer for dance since 2008 and has composed the scores for Dawson’s day4 and Empire Noir, both commissioned by Dutch National Ballet.